Trips into the backcountry give you the opportunity to turn months of planning and weeks of deprivation into some of the most outstanding moments you will ever experience. And the best thing about it: You don’t need to be rich. The most important things are stamina and a passion for the adventure. It’s completely dark at 2 a.m. in the morning and we are hauling our backpacks and fishing rods over a remote, trackless ridge in the middle of nowhere. Surrounded by dense rainforest we get the feeling of walking through a bucket of glue. Every couple of meters our legs disappear in rotten wood. And often steep cliffs or giant fallen trees are forcing us to take another route. It’s exhausting, sometimes frustrating and it will take us another hour to cover the last kilometre back to our camp. But it’s well worth the effort. We are tramping through some of the most amazing landscapes we have ever seen – rarely visited by other anglers – in search of large trout. New Zealand is probably one of the best destinations to venture if you are planning a backcountry trip on your own. There is nothing out there that could harm you (snakes, bears etc. ), the fishing license is cheap and you will find an excellent infrastructure for trampers, including good tracks and cosy backcountry huts. And the most important thing: There is a vast number of excellent trout fishing streams. Even if you would spent your whole life fishing there, you wouldn’t be able to cover all the water. 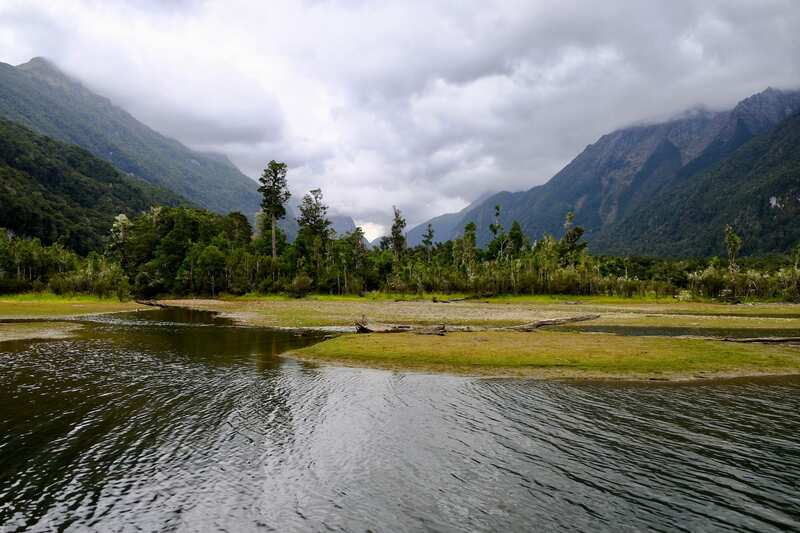 During our four-week-trip in January we fished high country spring creeks in Canterbury, remote rivers in Fiordland and the Kahurangi National Park and a couple of streams in the Nelson region. All of them are crystal clear, offering the opportunity to sight fish for large trout. The smallest creek we fished in Canterbury had a flow rate of just two cumecs per second. It is a tiny tributary of a bigger water system where salmon swim up the river every year to spawn. When we were walking along the first section of the creek we didn’t expect a single fish in it because it was so small. But after a couple of meters we spotted a nice brown trout. It was slurping nymphs from just below the surface. Unbelievable! Patrick approached the fish very carefully from below, tossing a pheasant tail in size 16 on an 18 feet leader in front of the fish. After the third cast the fish swung to the side and inhaled the fly. It was on and fighting like crazy, almost stripping off the entire line on the first run. After ten minutes the fish was carefully guided into the net. And it was a lot- bigger than we thought probably weighing in at around 8lbs. What a nice kick-off. After another hour we had spotted six fish of a similar size – unfortunately spooked most of them – and landed another nice brown with about 5lbs. A fishing day we will never forget. But it didn’t always come this easy. Imagine standing in a place as remote as it gets and spotting a big double figure brown sipping off dry flies from the surface just below your feet. We had this sort of situation a couple of times in the Kahurangi National Park. But catching these trout is a different game. We tried everything: approaching the pool crawling in slow motion and just making casts when the fish were facing away from us. Even super long 7x tippets presenting the dry fly 18 feet in front of the cruising fish, didn’t do the trick. It felt like we were fishing for trout smarter than ourselves. But even if we didn’t catch them, observing those fascinating creatures was something that burned itself into our minds. 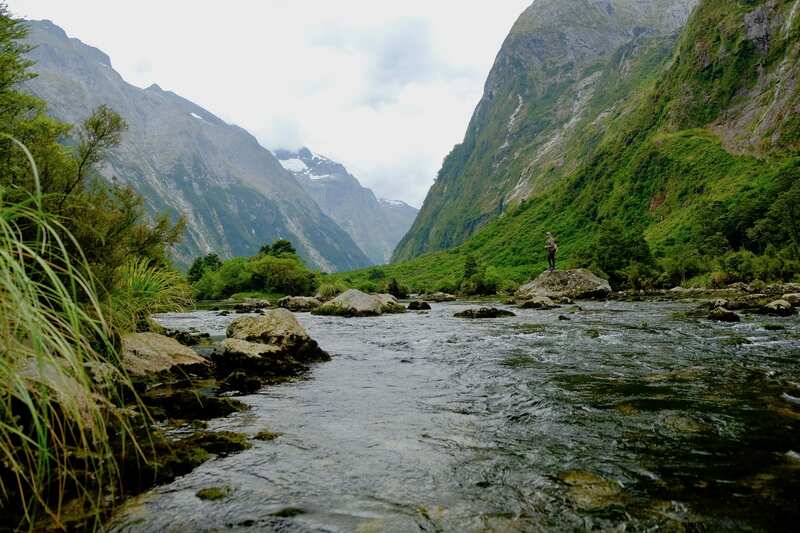 Fly Fishing New Zealand for trout can be very tricky. A lot of times they will see you before you see them and seek a shelter. But sometimes they are in a feeding frenzy. I remember one week in Fiordland when rainbows attacked nearly every dry fly we were casting at them. None of these fish was below 4lbs. Some of them were stripping off the line all the way to the backing on the first run and some others jumped four feet high into the air. It was probably the best fishing week we had in our lives and we didn’t encounter another fishermen in the entire area. 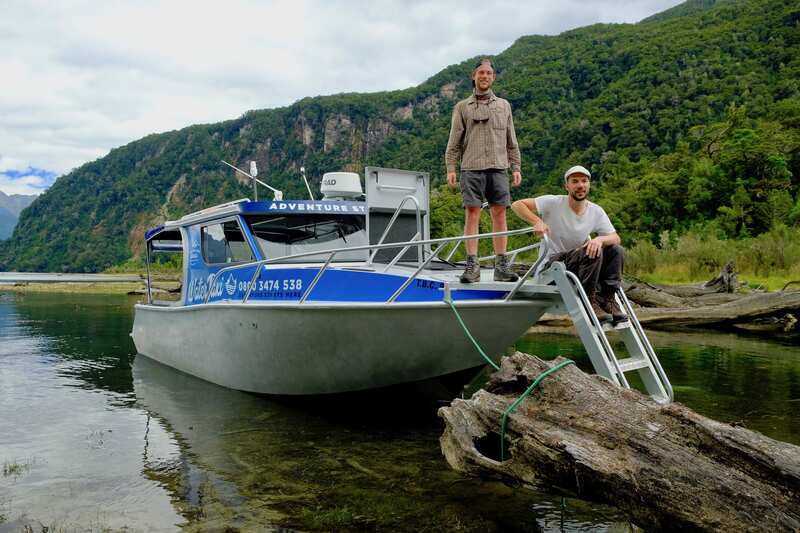 Our trip to New Zealand was not only memorable in terms of fishing. Experiencing extreme tranquillity without any man made noise, viewing the stars undisturbed by any other source of light and being totally free away from any other human being is something you have to experience in order to be able to understand. The food tastes better than in any five star restaurant even though it is freeze dried. You smell and see a lot more because your senses are not flooded and you start to realise what life is about. It’s not about your status in society, nor about houses or fancy cars – It’s about enjoying every single moment. Check out Streamline’s Instagram profile or watch their videos. 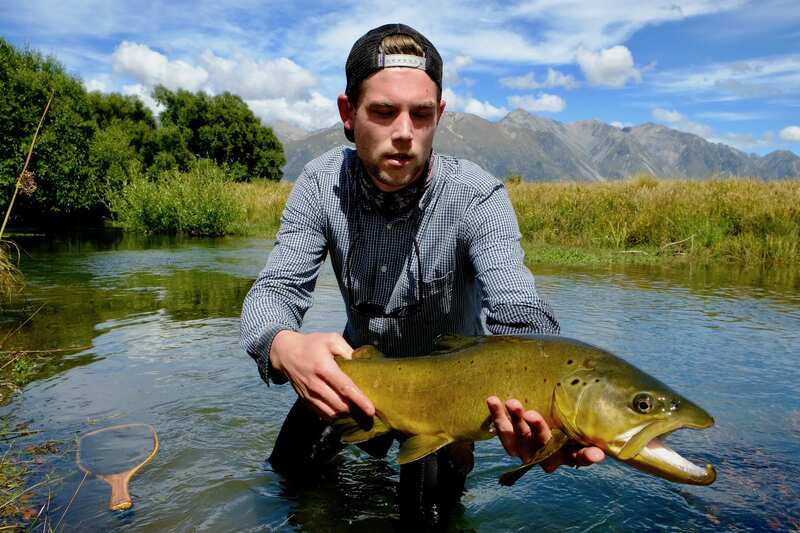 Daniel and Patrick are currently producing a low budget film about fly fishing New Zealand. It will be out in fall 2018.